The design is now outdated, and modern Windows versions are not supported, but I no longer work with Delphi, so there will be no further development. The current and last version is 3.0.0, which includes snooze alarms and numerous usability improvements. See the nthClock release notes for a list of changes. 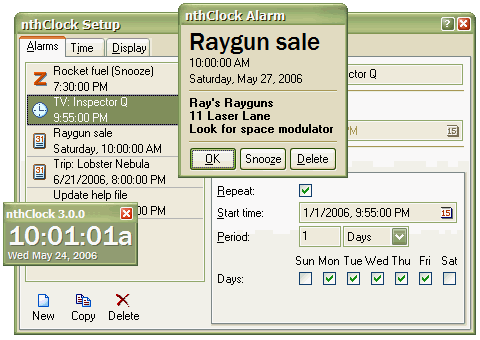 nthClock is compatible with Windows XP, 2000, Me, 98, and 95 only. To install nthClock, download the nthClock 3.0.0 install program (3.8 MB), unzip it, double-click 'Setup.exe', and follow the instructions. Be sure to check 'Yes, Launch the program file' when the 'Setup Complete' form is displayed. nthClock has copyright ©2001 Jeremy Kelly. Its use and distribution are subject to the terms of the GNU General Public License. The application was developed with Delphi 5. The nthClock 3.0.0 source files (60 KB) are not needed to use the program. Questions may be directed to support@anthemion.org.